Taj Traders conceived its business operation in the year 2013 as a sole proprietorship firm in the industry. We offer an exclusive range of kitchen accessories and equipments widely used at different places. We are the supplier and trader of our entire product range and started our business operation from Bengaluru, Karnataka (India). 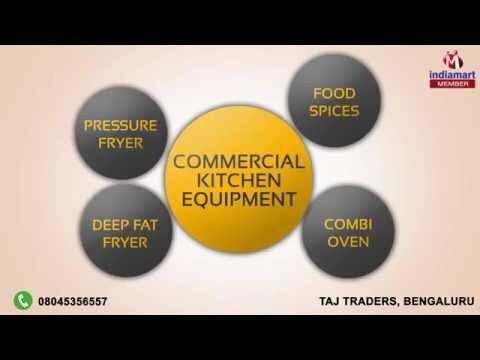 Our product range includes Pressure Fryer, Deep Fat Fryer and Commercial Kitchen Equipment. We ensure our prestigious clients with quality that comes before everything. It makes us accountable to deal in products and equipments that are designed with utmost consideration to user friendly operation, reliable performance, easy maintenance and high durability. The secret behind our success to provide valuable solution to every client is our ability to understand the challenge, and this would not have been possible without our team of experts. Their passion of work drives us to address the evolving needs of the modern kitchen by exceeding the expectations of our prestigious clients and equip us to achieve higher milestone in the industry.